Driving wheelset, ex 76080, photographed during a painting session at Eardington. Much of the content of the 5th August meeting at Kidderminster focused on fund raising. We would very much like to hear from anyone skilled in this activity who would like to take on this onerous task for us. So far no one has volunteered their services for this duty. Severn Valley Railway staff will be present at the Warley Model Railway Exhibition at the National Exhibition Centre in Birmingham on 2nd and 3rd of December promoting the Severn Valley Railway. BR Standard class 4 No.80079 will there to provide a suitable backdrop and we have been invited along to promote 82045 as a future aspect of the SVR. Perhaps this is an opportune moment to remind readers that the Severn Valley Railway is not able to financially assist our project to construct 82045 and any engineering work that they may undertake for us would have to be paid for on a contract basis. Our fate is in our own hands. We now have a new leaflet to aid our promotional activities, with a membership application section forming the back page. We also have the painting of 82045 which was briefly announced in our last newsletter. This is a watercolour by Edinburgh based artist Robin Barnes. The scene is a fictional one somewhere on the Cambrian lines and features 82045 in lined green piloting a Dukedog. We will shortly have prints available for sale. The scene has been incorporated as the centrefold in our new promotional leaflets. Robin Barnes has a website of his own where his work can be viewed. Bachmann are preparing to introduce the BR Standard class 3 tank locomotive in various liveries as an addition to their product range in N gauge. Chris and Tony visited their works in the Summer which resulted in our receiving copies of over twenty of the BR engineering drawings which will be needed to aid the construction of our loco. We are very grateful to Bachmann for this generous gesture. It has been a fairly quiet summer on the engineering front. 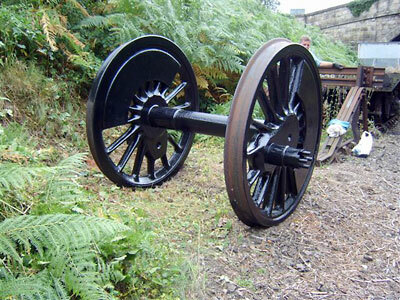 The centre driving wheelset at Erdington has received its coat of black gloss paint and some of the small second hand parts in storage have been cleaned and painted. We are anxious to be cutting new metal with a vengeance but the scale of this is dictated by finance. Our thoughts are turning towards the frames and we learnt that another new build project at another railway paid £7000 including the VAT for the purchase and profiling of their two main frame plates a couple or so years ago. This sort of figure is an achievable target by supporters digging a little deeper in their pockets. All the other add on bits for the frames such as the stretchers, horn guides, buffer beams etc. can then become individual targets in their own right until the jigsaw starts to come together as a whole. We already have the drawings for the frame arrangement, frame angles, frame slotting, frame drilling. Those for the other components referred to are listed and can be readily purchased. However the key to real forward progress is the finance. As a result of the last paragraph of the newsletter revealing the price paid by another new build project for their two main frame plates, two of our members have very generously pledged a significant amount of money towards our achieving the same objective. The bad news is that initial enquiries to the West Midlands engineering company that carried out that work shows that inflationary pressures have pushed up the price of steel. A drawing of our frames has been forwarded to that company to enable them to submit a quotation. We are therefore appealing directly to all of you who wish to see the dream of a new BR Standard class 3 tank engine turn to reality to support the actions of the two members and pledge some financial assistance however small. We need to act now before inflation takes a further toll on steel prices. The two frame plates are amongst the bigger and heavier components of the locomotive as well as being a starting point for adding on additional components. To have them in our possession would boost both our morale and our credibility to the heritage railway world.